A female African elephant (Loxodonta africana) curls her trunk at the Cheyenne Mountain Zoo in Colorado. 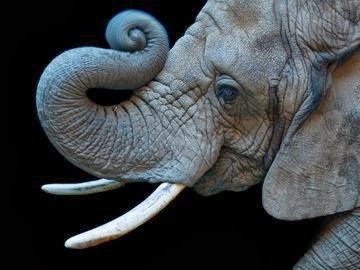 Sartore photographed the elephant as part of his Photo Ark project, through which he is documenting thousands of rare species. "Half of all the species on Earth could be headed irreversibly toward extinction by 2100. Not if I can help it," Sartore says. "That's the idea behind the Photo Ark: getting the public to look these creatures in the eye, then care enough to save them while there's still time."